Plus, prominent Etrian Odyssey staffers contributing to art and music. As you might’ve already determined from yesterday’s leaks, this week’s issue of Famitsu is dense with information on a couple of the upcoming Persona games, with Persona Q: Shadow of the Labyrinth being one of two. While much of that article is designed to serve as an overview of already known information, some new details have nevertheless been slipped into the magazine, particularly with regard to the game’s StreetPass functionality and the involvement of key Etrian Odyssey staff members. 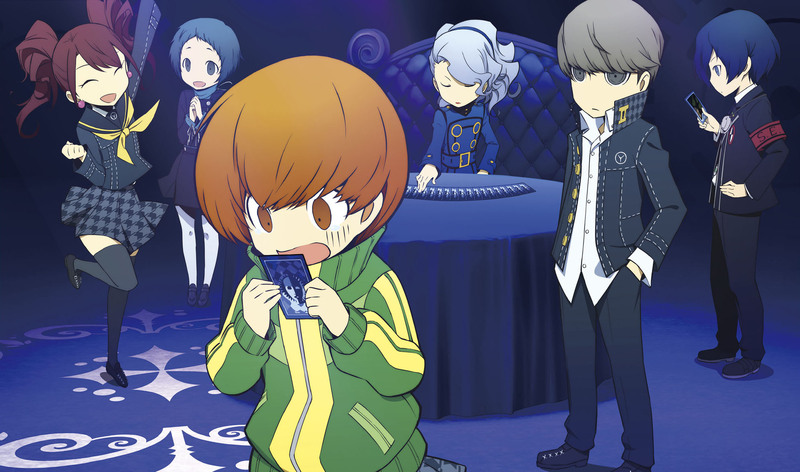 Similar to other Shin Megami Tensei games on the 3DS, Persona Q‘s StreetPass functionality involves players sharing their Personas with each other. By registering one into a special notebook for public consumptions, players who StreetPass with each other get the other person’s Persona added to their compendium, which can naturally be advantageous for gaining strong Personas sooner rather than later. For players that live too far away to readily StreetPass, they can also replicate this functionality by posting QR codes online. Another prominent new gameplay mechanic announced in the magazine is the “Sacrificial Fusion.” While powerful Personas have traditionally been gained in the series by fusing two or more together to form a new one, Persona Q also provides the option this time to sacrifice one Persona to strengthen up another. The specifics on how the remaining Persona is strengthened aren’t mentioned in the magazine, except to say that their ability set will resemble that of the sacrificed Persona and that the feature is a way to make use of under-leveled Personas. A handful of other new features are also detailed. Save slots, for instance, top out at 19, with three readily available on the cartridge itself and another 16 that can be saved to an SD card. There’s also said to be a reward for meticulous cartographers who go out of their way to map out the entirety of the dungeon floor in the form of treasure chests that they can raid for especially advantageous goods. Players who find that to be too much effort aren’t out of luck, though, as they can also unlock access to the chest by paying in Play Coins. Finally, a handful of prominent members from the Etrian Odyssey team are said to be contributing art and music assets for special enemies that will be appearing in the game. Character designer Yuji Himukai, for example, has done the artwork for a still unknown formidable metallic-looking enemy that the cast will end up fighting at some point in the game. Complimenting that work is famed composer Yuzo Koshiro, whose music will play when the player encounters Himukai’s enemy. Monster designer Shin Nagasawa is also on board with enemy designs of his own, some of which, such as the ghastly nurses seen in the game’s first trailer and the regal queen-like enemy seen in the Persona 3 version of the third trailer, have already been shown off in existing promotional material. Persona Q: Shadow of the Labyrinth is due out for 3DS in Japan on June 5, with a North American release following this fall.